A duo offer pack - consisting of one of our fabulous standard size cast iron potato cookers and one of our new Hellfire cast iron panini cooker / bacon presses with removable handle. The perfect Christmas gift for a friend or relative with a wood burning / multi fuel stove. Quirky, unusual and very very useful. See individual products for full details. 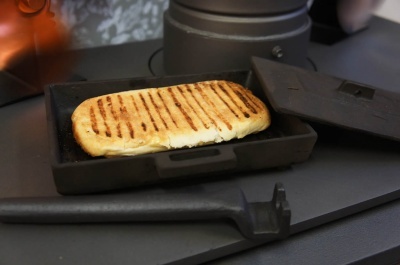 Our cast iron cookware for use on top of and also inside of wood burners / multi fuel stoves can also be used inside normal ovens and on gas hobs. 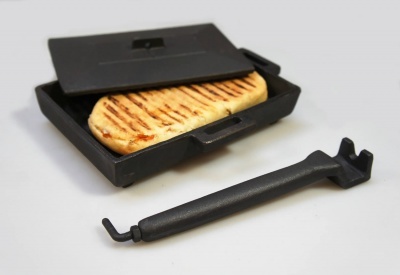 It's quality cast iron, made to last. 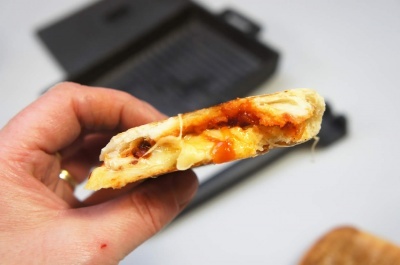 Easily cared for, just lightly oil to protect the surface, as you would a wok before use and after cleaning. Also worth looking at our seasoning paste recipe for applying a non-stick coating. 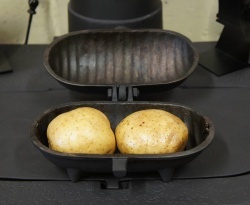 The standard size cast iron baked potato cooker is small enough to fit on top of practically any stove, yet big enough to hold up to two medium (250g / fist sized) potatoes or one gigantic spud. 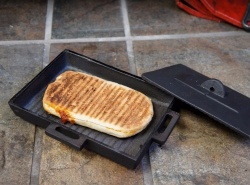 The Cast iron panini cooker consists of a 3 pc set : base part, top lid and presser tool.